The Trip to Echo Spring NPR coverage of The Trip to Echo Spring: On Writers and Drinking by Olivia Laing. News, author interviews, critics' picks and more. Examines the connection between creativity and alcohol by traveling to locales well-loved by six of America's greatest writers, who were also alcoholics, including John Cheever's New York, Tennessee Williams' New Orleans and Ernest Hemingway's Key West. January 11, 2014  In her new book, The Trip To Echo Spring, Olivia Laing investigates the role of drinking in the lives of six great American writers: Ernest Hemingway, F. Scott Fitzgerald, John Cheever, John Berryman, Tennessee Williams and Raymond Carver. January 3, 2014  A new book by critic Olivia Laing explores the link between alcohol and writing through the commentaries of famous writers who were themselves alcoholics. Fresh Air's Maureen Corrigan calls Laing's readings "exquisite," and says she wisely avoids "any one-size-fits-all conclusions about the bond between the pen and the bottle." 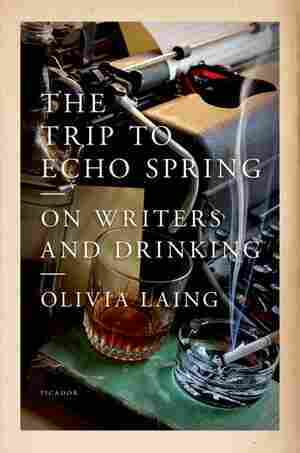 December 31, 2013  Olivia Laing illuminates the complex relationships between writers and alcohol in The Trip to Echo Spring — Echo Spring being, of course, the euphemism Tennessee Williams used for the liquor cabinet in Cat on a Hot Tin Roof. Reviewer Jane Ciabattari says the book is "beautifully written, haunting, tragic and instructive in the best sense." Note: Book excerpts are provided by the publisher and may contain language some find offensive. HERE’S A THING. IOWA CITY, 1973. Two men in a car, a Ford Falcon convertible that’s seen better days. It’s winter, the kind of cold that hurts bones and lungs, that reddens knuckles, makes noses run. If you could, by some devoted act of seeing, crane in through the window as they rattle by, you’d see the older man, the one in the passenger seat, has forgotten to put on his socks. He’s wearing penny loafers on bare feet, oblivious to the cold, like a prep school boy on a summer jaunt. In fact you could mistake him for a boy: slight, in Brooks Brothers tweeds and flannel trousers, his hair immaculately combed. Only his face betrays him, collapsed into hangdog folds. They drive away, passing the bottle back and forth. Within a few hours they’ll be back at the University of Iowa, swaying eloquently in front of their respective classes. Both are, as if it isn’t obvious, in deep trouble with alcohol. Both are also writers, one very well known, the other just cresting into success. John Cheever, the older man, is the author of three novels, The Wapshot Chronicle, The Wapshot Scandal and Bullet Park, as well as some of the most miraculous and distinctive stories ever written. He’s sixty-one. Back in May, he was rushed to hospital with dilated cardiomyopathy, testament to the almighty havoc alcohol wreaks upon the heart. After three days in the Intensive Care Unit he developed delirium tremens, becoming so violently disturbed he had to be secured with a leather straitjacket. The job at Iowa – a semester teaching at the famous Writers’ Workshop – must have seemed like a passport to a better life, though it isn’t quite panning out that way. For various reasons he’s left his family behind, living like a bachelor in a single room at the Iowa House Hotel. Raymond Carver, the younger man, has also just joined the faculty. His room is identical to Cheever’s, and immediately beneath it. The same painting hangs on both their walls. He’s come alone too, leaving his wife and teenaged children in California. All his life he’s wanted to be a writer, and all his life he’s felt circumstance set hard against him. The drinking’s been going on for a long while, but despite its depredations he’s managed to produce two volumes of poetry and to build up quite a clutch of stories, many of them published in little magazines. At first glance, the two men seem polar opposites. Cheever looks and sounds every inch the moneyed Wasp, though closer acquaintance reveals this to be a complex kind of subterfuge. Carver, on the other hand, is a millworker’s son from Clatskanie, Oregon, who spent years supporting his writing with menial jobs as a janitor, a stockboy and a cleaner. They met on the evening of 30 August 1973. Cheever knocked on the door of room 240, holding out a glass and announcing, according to Jon Jackson, a student who was present at the time: ‘Pardon me. I’m John Cheever. Could I borrow some Scotch?’ Carver, elated to meet one of his heroes, stutteringly held out a vast bottle of Smirnoff. Cheever accepted a slug, though he turned his nose up at the embellishments of ice or juice. One of those people is Neddy Merrill, a slender, boyish man with an attractive air of vitality about him. Trotting out into the sunshine for a morning dip in his host’s pool, he’s struck by a delightful idea: that he will make his way home by way of a ‘string of swimming pools, that quasi-subterranean stream that curved across the county’. He names this secret road of mixed waters Lucinda, in honour of his wife. But there’s another liquid path he also follows: a chain of drinks taken on neighbours’ terraces and yards, and it’s this more perilous route that leads him downwards by degrees to the story’s uncanny and tragic end. High on his marvellous plan, Neddy swims through the gardens of the Grahams and the Hammers, the Lears, the Howlands, the Crosscups and the Bunkers. As he passes on his self-appointed way he’s plied with gin by ‘natives’ – whose customs, he thinks to himself disingenuously, ‘would have to be handled with diplomacy if he was ever going to reach his destination’. The next house he reaches is deserted, and after he’s crossed the pool he slips into the gazebo and pours himself a drink: his fourth, he calculates vaguely, or perhaps his fifth. A great citadel of cumulus has been building all day, and now the storm breaks, a quick paradiddle of rain in the oaks followed by the pleasurable smell of cordite. Neddy likes storms, but something about this downpour changes the tenor of his day. Sheltering in the gazebo, he notices a Japanese lantern that Mrs. Levy bought in Kyoto ‘the year before last, or was it the year before that?’ Anyone can lose their footing in time, can misstep a beat or two of chronology. But then there’s another queer flicker in temporality. The rain has stripped the maple, and the red and yellow leaves lie scattered on the grass. It’s midsummer, Neddy thinks robustly, and so the tree must simply be blighted, but this sign of autumn gives him an unpleasant shot of melancholy. The sense of foreclosure deepens. At the Lindleys, the jumping ring is overgrown and the horses seem to have been sold. Worse, the Welchers’ pool has been drained. The Lucinda, that magical, abundant river, has run dry. Neddy is staggered, and begins seriously to doubt his command of time. ‘Was his memory failing or had he so disciplined it in the repression of unpleasant facts that he had damaged his sense of the truth?’ He pulls himself together though, rallying enough to cross Route 424, a portage more effortful and exposing than he’d expected. Next he braves the public baths, with their whistles and murkish water. No pleasure there, but he’s soon up and out, clambering through the woods of the Halloran estate towards the dark, dazzled gold of their springfed pool. But here comes another offbeat, a sense that the world Neddy is travelling through is somehow strange to him, or he to it. Mrs. Halloran asks solicitously about his poor children, muttering something too about the loss of his house. Then, as he walks away, Neddy notices his shorts are hanging around his waist. Is it possible, he wonders, that he’s lost weight over the course of a single afternoon? Time is slopping around like gin in a glass. It’s still emphatically the same day, but now the warmth of midsummer has dissipated and the smell of wood smoke is articulate in the air. From the Hallorans Neddy travels to their daughter’s house, hoping to beg a glass of whiskey. Helen greets him warmly enough, but her house is dry and has been for three years. Bewildered, chilled to the bone, he heaves his way across the pool and cuts through the fields to the Biswangers. From the roar of voices it’s evident a party is in full swing. He wanders in, still almost naked. But now, mysteriously, it’s twilight, and the water on the pool has ‘a wintry gleam’. Mrs. Biswanger, who has angled for Neddy as a guest for years, has apparently suffered some change of heart. She greets him rudely, and when his back is turned can be heard saying: ‘They went for broke overnight – nothing but income – and he showed up drunk one Sunday and asked us to loan him five thousand dollars.’ Then the bartender rebuffs him, confirming his sneaking sense that some social loss of grace has occurred, and been remembered and recorded. Struggling on, he passes next through the garden of a former mistress, though he can’t remember precisely when or in what mood he broke it off. She isn’t wholly pleased to see him either, and is likewise fretful about the possibility that he wants money. Leaving, he catches on the cooling air an autumnal smell, not quite placeable but ‘strong as gas’. Marigolds? Chrysanthemums? Looking up, he sees the winter constellations have taken up their stations in the night sky. Flooded with uncertainty, he begins, for the first time in his life, to cry. There are only two more pools to go. He flails and gasps through the final laps before walking in damp trunks up the drive to his own house. But now the hints about a downturn in his fortunes begin to clarify, for the lights are out, the doors are locked, the rooms are empty and nobody, it is clear, has lived here for a long while. ‘The Swimmer’ had come into my mind because I was plummeting through the sky above New York, where the land breaks apart in a clutter of islands and marshes. There are some subjects one can’t address at home, and so at the beginning of the year I’d left England for America, a country almost entirely unknown to me. I wanted time to think, and what I wanted to think about was alcohol. I’d spent the winter upcountry, in a cottage in New Hampshire, and now it was spring and I was moving south. Last time I’d passed over here the earth was white all the way up to the Arctic, and the Connecticut River turned through dark bars of forest frozen the metallic blue-grey of the barrel of a gun. Now the ice had melted, and the whole landscape was ablaze. It reminded me of Cheever’s line – that to live ‘in a world so generously supplied with water seemed like a clemency, a beneficence’. ‘The Swimmer’, which I would judge among the finest stories ever written, catches in its strange compressions the full arc of an alcoholic’s life and it was that same dark trajectory I wanted to pursue. I wanted to know what made a person drink and what it did to them. More specifically I wanted to know why writers drink, and what effect this stew of spirits has had upon the body of literature itself. Alcoholism is not a simple condition to define. According to the American Society of Addiction Medicine, its essential features are ‘impaired control over drinking, preoccupation with the drug alcohol, use of alcohol despite adverse consequences, and distortions in thinking, most notably denial’. In 1980, The Diagnostic and Statistical Manual of Mental Disorders dropped the term ‘alcoholism’ entirely, replacing it with two interrelated disorders: alcohol abuse (defined as ‘repeated use despite recurrent adverse consequences’) and alcohol dependence (defined as ‘alcohol abuse combined with tolerance, withdrawal and an uncontrollable drive to drink’). There’s something about these answers and the mixed motives they reveal that seems to catch at a deeper and more resonant aspect of alcohol addiction than the socio-genetic explanations that are in currency today. It was for this reason that I wanted to look at writers who drank, though God knows there’s barely a section of our society that’s immune to alcohol’s lures. After all, it’s they who, by their very nature, describe the affliction best. Often they’ve written about their experiences or those of their contemporaries, either transposed into fiction, or in the letters, memoirs and diaries they’ve used to mythologise or interrogate their lives. As I began to read through these rafts of papers, I realised something else. These men and women were connected, both physically and by a series of repeating patterns. They were each other’s friends and allies, each other’s mentors, students and inspirations. In addition to Raymond Carver and John Cheever in Iowa, there were other drinking partnerships, other vexed allegiances. Hemingway and Fitzgerald tippled together in the cafés of 1920s Paris, while the poet John Berryman was the first person at Dylan Thomas’s bedside when he died. Then there were the echoes. I’d grown most interested in six male writers, whose experiences seemed to dovetail and mirror each other. (There were many women writers I could have chosen too, but for reasons that will become apparent their stories came too close to home.) Most of this six had – or saw themselves as having – that most Freudian of pairings, an overbearing mother and a weak father. All were tormented by self-hatred and a sense of inadequacy. Three were profoundly promiscuous, and almost all experienced conflict and dissatisfaction with regard to their sexuality. Most died in middle age, and the deaths that weren’t suicides tended to be directly related to the years of hard and hectic living. At times, all tried in varying degrees to give up alcohol, but only two succeeded, late in life, in becoming permanently dry. If I stopped a minute, I could picture each of them in turn. I saw Fitzgerald in a Guards tie, his blond hair slicked back, quietly certain about the merits of The Great Gatsby: a kind man, when he wasn’t whisking you into a waltz or boiling your watch up in a pot of soup. Ernest Hemingway I always pictured at the helm of a boat, or out hunting in the clean upland air, entirely focused on the task at hand. And then later, at his desk in glasses, making up the Michigan of the Nick Adams stories, making up corridas and cities, trout streams and battlefields, a world you can almost smell. Tennessee Williams I saw in Ray-Bans and safari shorts, sitting unobtrusively at the rehearsal of one of his own plays: A Streetcar Named Desire, say, or Suddenly Last Summer. It’s not locked yet, and so he fixes sections on demand, braying his donkey’s laugh at all the saddest lines. Cheever I liked to think of riding a bicycle, a habit he took up late in life, and Carver I always imagined with a cigarette, big-shouldered but walking softly. And then there was John Berryman, the donnish poet and professor, light gleaming on his glasses, his beard enormous, standing in front of a class at Princeton or the University of Minnesota, reading Lycidas and making the whole room see how marvellous it was. There have been many books and articles that revel in describing exactly how grotesque and shameful the behaviour of alcoholic writers can be. That wasn’t my intention. What I wanted was to discover how each of these men – and, along the way, some of the many others who’d suffered from the disease – experienced and thought about their addiction. If anything, it was an expression of my faith in literature, and its power to map the more difficult regions of human experience and knowledge. As to the origins of my interest, I might as well admit I grew up in an alcoholic family myself. Between the ages of eight and eleven I lived in a house under the rule of alcohol, and the effects of that period have stayed with me ever since. Reading Tennessee Williams’s play Cat on a Hot Tin Roof at seventeen was the first time I found the behaviour I’d grown up amid not only named and delineated but actively confronted. From that moment on I was preoccupied by what writers had to say about alcohol and its effects. If I had any hope of making sense of alcoholics – and my life as an adult seemed just as full of them – it would be by investigating the residue they’d left behind in books. There was a line from Cat in particular that had stayed with me for years. Brick, the drunkard, has been summoned by his father. Big Daddy is on a talking jag and after a while Brick asks for his crutch. ‘Where you goin’?’ Big Daddy asks, and Brick replies: ‘I’m takin’ a little short trip to Echo Spring.’ Physically, Echo Spring is nothing more than a nickname for a liquor cabinet, drawn from the brand of bourbon it contains. Symbolically, though, it refers to something quite different: perhaps to the attainment of silence, or to the obliteration of troubled thoughts that comes, temporarily at least, with a sufficiency of booze. for this cold swift water. The word trip also seemed important. Many alcoholics, including the writers I was interested in, have been relentless travellers, driven like uneasy spirits across their own nations and into the other countries of this world. Like Cheever, I had a notion that it might be possible to plot the course of some of these restless lives by way of a physical journey across America. Over the next few weeks, I planned to take what is known in AA circles as a geographical, a footloose journey across the country, first south, through New York, New Orleans and Key West, and then north-west, via St. Paul, the site of John Berryman’s ill-fated recovery, and on to the rivers and creeks of Port Angeles, where Raymond Carver spent his last, exultant years. Looked at on a map, this itinerary seems haphazard, even a little masochistic, particularly since I’d resolved to travel largely by train. Like many things to do with the subject, though, its real meaning was encoded. Each of these locations had served as a way station or staging post in which the successive phases of alcohol addiction had been acted out. By travelling through them in sequence, I thought it might be possible to build a kind of topographical map of alcoholism, tracing its developing contours from the pleasures of intoxication through to the gruelling realities of the drying-out process. And as I worked across the country, passing back and forth between books and lives, I hoped I might come closer to understanding what alcohol addiction means, or at least to finding out what those who struggled with and were sometimes destroyed by it thought alcohol had meant for them. The first of the cities was fast approaching. While I’d been gazing out of the window, the seatbelt sign had switched to green. I fumbled for the pin and turned again to the glass. Outside, the ground was rising swiftly through the colourless miles of air. Now I could see Long Island, and beyond the ruffled waters the runways of JFK. Silhouetted behind it were the skyscrapers of Manhattan, rising like iron filings into the pale sky. ‘These stories seem at times to be stories of a long-lost world when the city of New York was still filled with a river light,’ John Cheever once wrote wistfully about the city he most loved. It did indeed seem to shine, an island citadel bounded by water, the Atlantic flashing pewter as we hedged in above the waves.